Science is a subject my girls enjoy but I'll admit when it comes to experiments they don't always get done at our house. 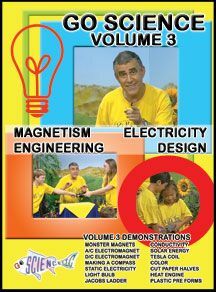 The last couple of weeks we have been watching a lot of demonstrations with the Go Science DVDs. 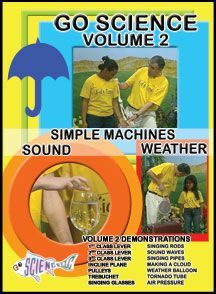 The Go Science series is recommended for ages 6-14 and contains a collection of high energy science demonstrations given by Ben Roy. There are 6 volumes in the series and each physical or chemical demonstration contains a spiritual application and points to our Creator. We were given our choice of 2 volumes of Go Science from Library & Educational Services. I asked my girls what they wanted & they chose Volume 2 & 3. Ben Roy does a great job with the demonstrations. They are explained and demonstrated in a way that all three of my girls ages 7, 9, & 11 could understand. All demonstrations are complete and there is no need to recreate them on your own to understand the concept, but my girls were very eager to complete the demonstrations on their own when we had all the equipment. Several of them use items that you don't always have around the house and don't necessarily want to purchase just to use for an one-time project. We feel that Ben is very passionate about what he does but we thought he talked babyish to the students. There were a few demonstrations that left us wanting to know more & that encouraged my daughters to do some further research. 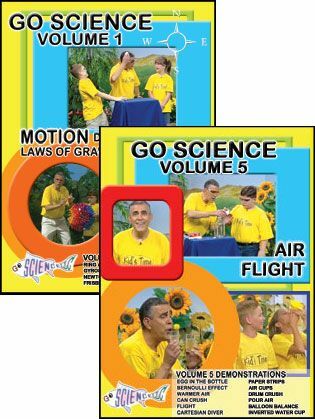 This set of DVDs would make a great addition to any homeschool library, but especially those homeshools that don't get science projects completed on a regular basis. Library & Educational Services is an online wholesale supplier of educational books, DVDs, CDs, and more. They have been committed to excellence in their products and customer service for over thirty years. Their products are 30%-70% off retail price and wholesale customers include resellers, educators, libraries, churches, schools, and homeschools. The 6 Volume set of Go Science retails at $79.95 but Library & Educational Services offers it for $47.95. Each title can be purchased separately for $8.97 from Library & Educational Services or retail for $14.95. Sail over to the Schoolhouse Crew blog to read what other crew members thought of Go Science, & Library & Educational Service. Disclaimer: I received 2 Go Science DVD's from Library and Educational Services, free of charge to use with my children, in exchange for my honest review. 5 Day Blog Hop Coming Soon! !